We have another virtual baby show today! The longer I blog, the more wonderful women I meet. Each blogger brings something unique and different to the table. 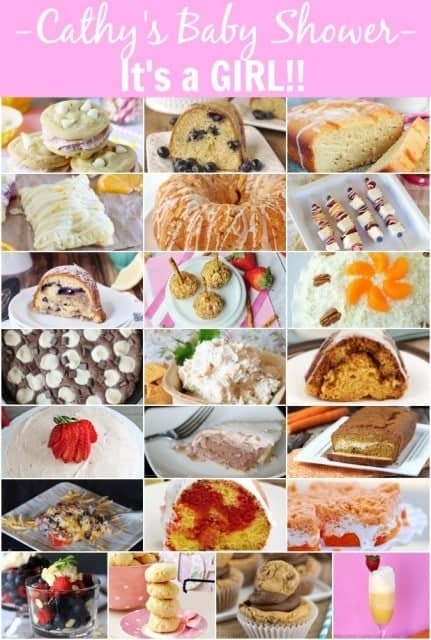 Cathy from Lemon Tree Dwelling make the most tasty looking desserts, savory appetizer and fun DIY projects. My recent favorites are her Orange Creamsicle Circus Animal Cookies and Skittles Rainbow Fudge. Although I have never met Cathy in person, I hope that one day I can! Cathy is also BFFs with Lisa from Wine and Glue. Both Lisa and Cathy have babies that are just a couple months apart, and low and behold they are both due around the same time this time around! I can only imagine how fun that must be to be pregnant with your best friend, not only once but twice! 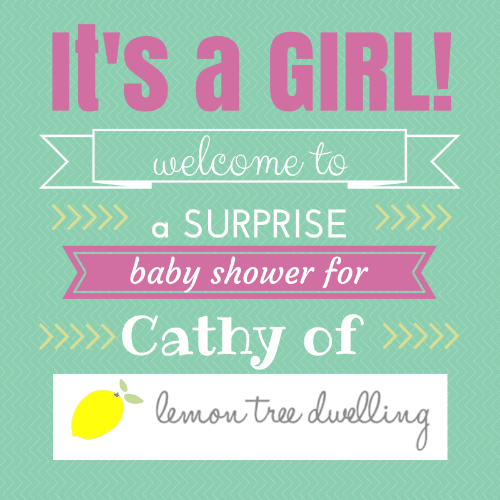 Congrats Cathy! I am a believer that the best thing about parties is the food. I am a total taster. I need to have a little bite of everything. 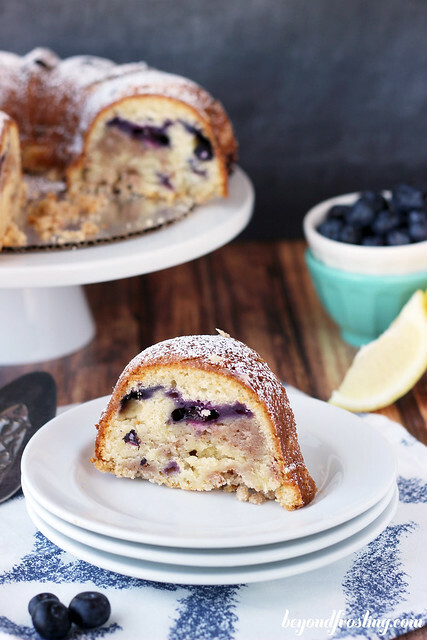 So the decision to make this Lemon Blueberry Bundt Cake for Cathy’s baby shower was not taken lightly! 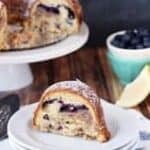 Just about all of my bundt cakes have streusel, so does that make it a coffee cake? I don’t know you decide. This cake is the perfect spring time treat. 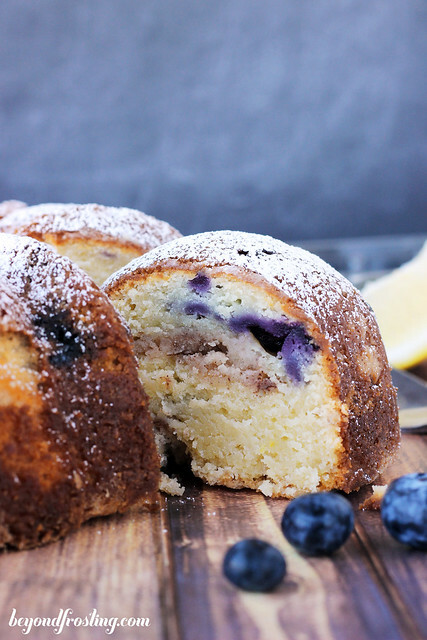 There is a bold lemon flavor and plenty of juicy blueberries. I decided that I needed to keep this cake on the lighter side and dust it with powdered sugar instead of a glaze. I think this was the right decision. I mean, we are all looking to save a few calories before bikini season right? The great thing about this cake is that the fruit can be substituted for raspberries or blackberries! This recipe is built from my grandmother’s sour cream coffee cake. The sour cream helps keeps this cake extra moist. It is a similar recipe to what I did for my Apple Pie Coffee Cake. I just made this last night to bring to an event this week. 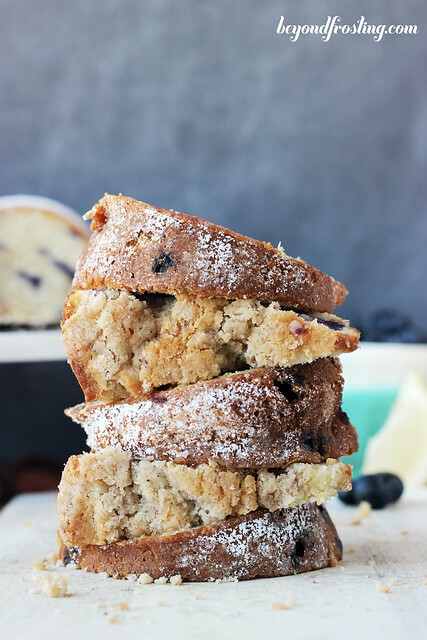 I have a serious weakness for coffee cake! There are lots of Cathy’s friends sharing recipes for her virtual shower today, so be sure to scroll down and check them all out! 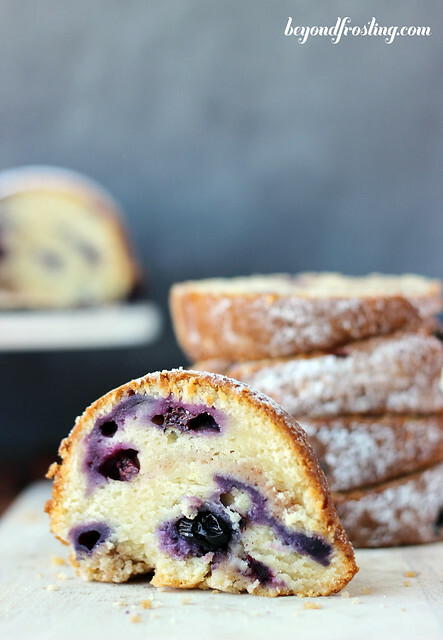 A sour cream cake infused with lemon and fresh blueberries. Rinse and dry blueberries. Coat blueberries with 1/4 C flour by mixing with a spoon. Butter should be at room temperature or slightly firmer, not melted. Combine sugars with softened butter. Beat on medium speed until butter and sugar are well combined, light and fluffy. Add eggs, one at a time, beating each egg into the butter and sugar one at a time. After both eggs have been mixed, add vanilla, sour cream, lemon zest and lemon juice. Beat on medium speed until well combined. In a separate bowl, Sift flour and then measure out 2 cups. Add salt and baking powder. Stir to combine. Slowly add flour mixture to batter and mix on low speed just until combine. Batter will be thick. Melt butter in microwave, about 30 seconds. Combine all dry ingredients in a medium sized bowl. Pour melted butter over dry ingredients and stir until well mixed. This mixture will be clumpy. Pour the batter into the pan. Cover the bottom with streusel. Bake at 350° F for 50-55 minutes. Bottom of cake will be slightly brown. Use a long toothpick or knife to stick in the middle of the cake. If it comes out clean, the cake is done. Set on a cooling rack for twenty minutes. Place a plate, cutting board or other flat surface; over top of cake and hold it together. Turn cake over and gently pat sides of the pan until the cake comes loose. Allow to cool for another 15-20 minutes. What a beautiful bundt cake that’s perfect for spring! I’m totally a taster too! This cake is gorgeous Julianne! Perfect for a baby shower…or any day really! Love blueberry and lemon together. Pinned and shared on Facebook! I love the lemon and blubbery combo! It looks delicious Julianne! one thing wrong with the recipe is, that it doesn’t tell you where to add the lemon zest or lemon juice. Hi Heather! Sorry about that and thank you for letting me know! You did it correctly! I have updated the recipe!